I never thought I’d say this, but thank God for cable television. As a Basic Cable family, we hold on to the Box because it lets us watch Comedy Central, Rachel Maddow, and the occasional broadcast for my hometown sports teams, the Reds and the Bengals. Most of the rest is wall-to-wall reality TV – nothing but “Redneck Vacation” and “Pawn Stars” as far as the eye can see. But something about the summer makes Cable throw caution to the wind, and the result is some pretty ridiculously wonderful television. So it is with SyFy’s Sharknado movies and Cartoon Network’s (Adult Swim) Black Jesus. 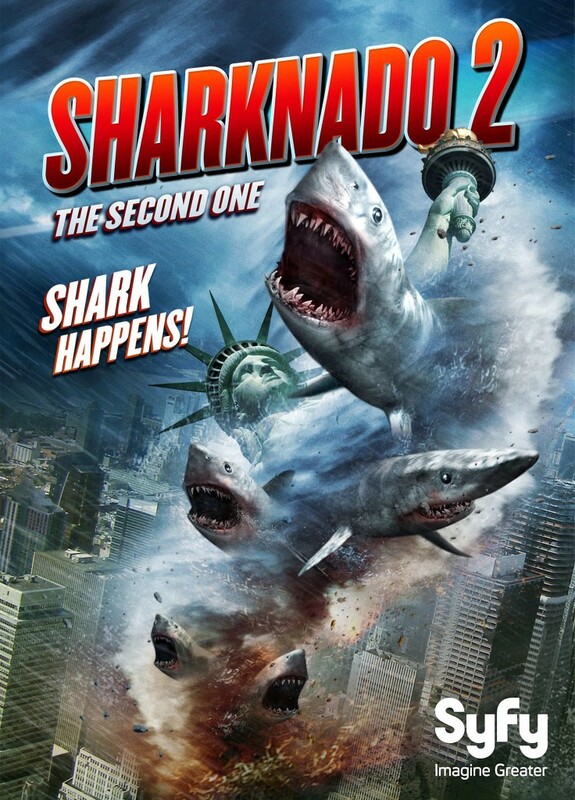 So seeing Sharknado 2 as it premiered on SyFy on July 30 (it will be in theaters, one night only, August 21st) was a pleasantly surprising follow-up. It was actually funny. The concept seemed to be that if you were willing to suspend belief for one tornado full of sharks attacking Los Angeles, you would gladly suspend belief for two tornadoes full of sharks attacking New York City. (But hey, as Fin said, “Even the Sharknadoes are tougher in New York.”) And while you were suspending disbelief, you’d be treated to ridiculous cameos, a media frenzy that included the Today Show, the Weather Channel, and Live with Kelly Ripa and Michael Strahan, and Tara Reid replacing a missing hand with a buzzsaw. Because…why not? It was also fun for its knowing homage to other sci-fi and fantasy classics. Early on, there’s a Shatner-esque “Twilight Zone” reference, with Ian Ziering’s “There’s a shark out there on the plane” moment. The tumbling Statue of Liberty head that takes out several innocent New York City sanitation workers reminds us of The Planet of the Apes. Of course, the whole thing ends up on the Empire State Building, in an ending both reminiscent of King Kong and Dr. Strangelove. I’m sure there were many other references I didn’t catch. On the down side, the film also adheres to the formula of the Hollywood Apocalypse, in which it doesn’t matter how many people are killed as long as the central family in the story survives. It’s particularly hard to care when the family surviving is not Ian Ziering’s kids or ex-wife, but his estranged sister and brother-in-law, the latter played by the stunning screen absence that is Mark McGrath. But what really made “The Second One”—as the deadpan tagline called the sequel—worth watching, was the way it parodied how natural disasters become media goldmines. 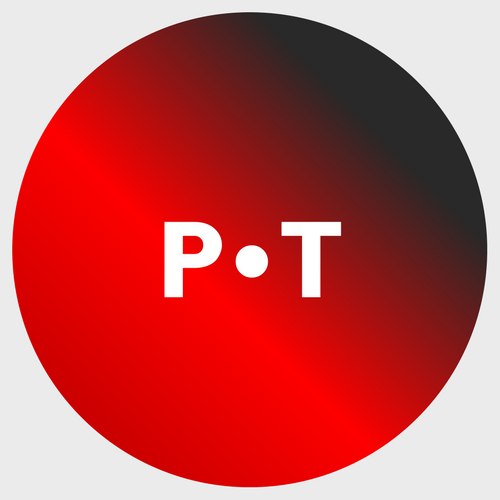 When we can watch disasters as they unfold on 24-hour news television and through Twitter and Facebook updates, they go beyond news to collective voyeurism. Al Roker and Matt Lauer were the most entertaining characters not only because they provided the Greek Chorus to the ludicrous goings-on outside the studio (at one point the wind throws an octopus against the window behind them) but because they parodied their own roles as news anchor-narrators during disaster coverage. How many times can the Weather Channel lady say, “Sharks should be raining down on New York at a rate of two inches per minute?” I counted three. It didn’t make any sense the first time, but the sheer repetitiveness captured the cable news genre perfectly. Let’s hope James Cone doesn’t have cable. I like Black Jesus because it suggests a Jesus that has human habits, tastes, and even foibles, and is still a loving and even admirable figure. This is a necessary corrective. I firmly believe most Christians, especially conservatives and evangelicals, are Docetists – that is, they don’t really believe Jesus was human. Not in any meaningful way. Everything he did was somehow perfect and according to plan, because he was the Son of God. Black Jesus may take James Cone’s thesis to the point of absurdity, but it’s an interesting experiment. If there truly were a “Black Jesus” from Compton, he would culturally look and act a lot more like Slink Johnson, than, say, Denzel Washington. 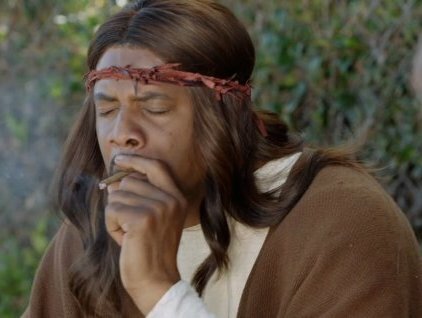 So let’s lift a little wine-gnac and smoke a blunt to a comedy Jesus that playfully nudges people’s assumptions about Jesus. Amen, sister. And a little blasphemy can be good for the soul. Let’s just hope Professor Cone doesn’t have a cable connection.